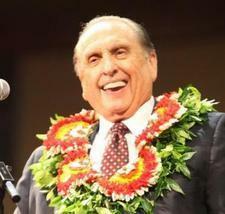 President Thomas S. Monson is at it again. With our enemies at the gates and the wolf at the door, he asked the Saints last Sunday to extend "the hand that helps and the heart that knows compassion." He did the same at LDS general conference a couple of weeks ago. The royal priesthood had assembled and was ready to roll. He told them to "leave unsaid the harsh and hurtful things we may be tempted to say." We were ready to sing "Vanquish every foe today!" Instead, we got "School thy feelings." Can't the president of the church see what's happening? Is he being shielded from reality? Someone has to let him know. The God of Israel is under siege. The gods of debauchery and desire have ascended to the throne. Taxes are taking a tremendous toll. The government is becoming our enemy. Our traditional values are getting washed away by paganism.